A Rabbitohs-Roosters clash was the natural sequel to Thursday night’s stunning Cowboys-Broncos standoff, and their final appearance against each other during the regular 2018 season didn’t disappoint. From the outset, the Bunnies were that little bit more volatile due to the unexpected delay of Greg Inglis’ return to the field, while a hamstring injury to Alex Johnston saw their fullback led off the field in the first two minutes, forcing them reconfigure their expectations as they fought to retain their position at the top of the ladder. On the other side of the Steeden, James Tedesco and Victor Radley put in one of their best performances of the 2018 season, although the entire team shone in these opening minutes. Isaac Liu and Jared Waerea-Hargreaves set the tone early on, shutting down Sam Burgess with a brutal tackle and making it clear, more generally, that the Roosters weren’t going to be intimidated by the Burgess trio. When Tom was led off the field for a thigh inspection, then, it felt like the natural conclusion of the opening act, which had targeted the Burgess boys over and over again. The first try came at the back of a sequence bookended by Tedesco. Just this week several articles have come out about how Teddy manages to combine the strength of a frontrower with the dexterity of a backliner, and that strength was on display here, as he managed to force a penalty while being tackled by the Bunnies pack at its most determined. A kick from Cooper Cronk got the Chooks a goal line dropout a couple of tackles later, at the end of which Radley showcased one of his best moves of the year to put his fullback over the line. Once again, the Burgess brothers were the casualties, as Radley twisted out of a tackle from Tom and managed to maintain possession of the ball during a follow-up effort from Reynolds. 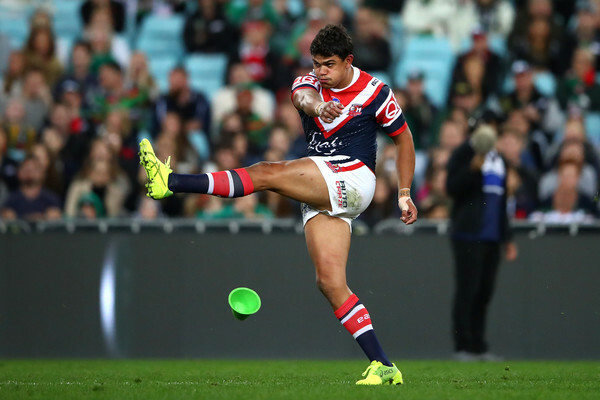 Amidst all that defensive energy, he was somehow able to simply hand the footy across to Teddy, who leaped across the line to put down the first four points of the night, which became six once Latrell Mitchell had booted the extras through the posts. Two great saves from Teddy now ensued, the first of which came when Cody Walker stripped the ball from him within the Roosters’ twenty, only for the ex-Tiger to hook it backwards for Blake Ferguson to regain possession. Halfway through the first stanza, Tedesco also regathered the football after it came off a Rabbitoh, setting the platform for a sequence that culminated with Radley orchestrating a penalty kick that brought the Roosters to 8-6 once Reynolds had added the two points. With the Roosters starting to dominate, and both Inglis and Johnston absent, the Bunnies needed a decisive four points to get themselves back in the game. They got their opportunity when Angus Crichton forced an error from Daniel Tupou on the second tackle of a Roosters set at the twenty-fifth minute. Five tackles later, Reynolds grubbered the ball through the Roosters’ defensive line, where Liu stuck out a boot and sent it back in the other direction. The big lock hadn’t counted on it bouncing off Reynolds’ chest, however, nor the good luck that ensured that the Bunnies’ halfback never got a hand to it, despite his best efforts. Arriving at the line at the same time as the Steeden, all he had to do was land on it to ground it, for a four-pointer that looked better and better with each replay. In retrospect, Reynolds could probably have just run the football, but it was also the width of the gap that led to Liu’s kick going astray, while the ricochet also took Tedesco by surprise, who arrived just too late to prevent Reyno scoring. In other words, this was just the kind of serendipitous moment that can so often motivate the Rabbiths when they’re lagging behind, and they managed to keep the Roosters out for the remainder of the first stanza, despite Mitchell clocking up another penalty goal at the thirty-seventh minute. For a moment, it looked as if Fergo had scored on the back of a Cronk kick, but the replay showed that he had lost the footy just as he hit the ground. It was a shame for Cronk as much as for Ferguson, since his work with the boot had been particularly dexterous, and especially punishing for Dane Gagai, who shifted into the fullback position after Johnston had been led from the field, and had to contend with one horrific bounce after another as the Chooks amped up the pressure. Over the rest of the night, Cronk would put in one terrific kick after another, taking sole responsibility for the boot over the full eighty minutes. The second stanza started out strong for the Roosters, thanks to some great judgement from Tedesco, who shouldered Walker out of the way as he was chasing down his own kick. At first it looked as if it might be a sin bin, or even a penalty try, and Walker certainly thought so, responding with a shove on the Roosters fullback that momentarily looked as if it might spill out into an Origin-worthy fracas. The replay showed, however, that Teddy had timed his defensive move perfectly, edging out Walker right as they came side to side. Still, the Bunnies got a dropout, and a penalty a couple of tackles later, allowing Reynolds to level the scores at 10-10. After such a decisive defensive gesture from Tedesco, though, these two points felt a bit deflating. A few sets later, the cardinal and myrtle faithful suffered a scare when a clip from Zane Tetevano saw Cook fall in an awkward way moments after he’d effected the quickest play-the-ball of the 2018 season. While Cook turned out to be fine, this momentary disruption shifted the momentum back in the visitors’ favour, and sure enough the Chooks were next to score. Ironically, it was a Reynolds kick that laid the platform, as the footy ricocheted off Boyd Cordner, who picked it up and ran with it, before offloading to Mitchell as he was brought to ground by the South Sydney defensive line, only for the Steeden to now bounce off the young Sydney City centre’s chest in turn. Reading the risks perfectly, Mitchell kicked the ball forward, taking his hands out of the equation until it was safe to dive down and secure it. From there, he got the footy across to Fergo, who drifted across the ruck before sending a short ball to Joseph Manu, who got ahead of the Rabbitohs defence to twist sideways in the air and land ball first in the right corner of the field. After a pair of tries up through the middle, it was rousing for the Roosters to score on the edge of the field, and the sense of freakish dexterity was only enhanced when Mitchell’s sideline conversion bounced off the far upright and went back through the posts. No doubt, the Roosters had had a bit of luck in the way Reynolds’ kick played out, but Reynolds himself had been equally lucky in the opening stanza, with the result that the same sense of serendipity now shifted back in the visitors’ favour. Moments later, a late tackle on Cronk from Sam Burgess got the Chooks a penalty kick and an eight point lead, while Burgess lost the Steeden again a couple of minutes later, for his third error of the evening. A penalty on John Sutton for a slow peel compounded the Rabbitohs’ woes, but things shifted abruptly when Zane Tetevano lost the football on the first tackle of the next set. All of a sudden, Sutton went from penalty leaker to penalty gainer, as a high tackle from JWH on the Bunnies veteran got the cardinal and myrtle a penalty of their own. Things were too urgent to take the two, and South Sydney chose to tap and go – a decision that paid off when a sublime backhanded flick pass from Braidon Burns sent Hymel Hunt over the corner, culminating a great game in the starting team for the Coonamble Bears junior. As luck would have it, Reynolds didn’t make the conversion, leaving it at a four point game as the last fifteen minutes of the game wound down. In the final ten minutes, Burns contributed an even more extraordinary try assist, booting the ball twice before popping it back into the field of the play before being slammed into touch, only for Cronk to wrap up Walker just as he was getting to it. In the final minutes, the Rabbitohs just didn’t seem to be able to make anything work for them, with Sam Burgess clocking up his fourth successive penalty of the night halfway through a critical set two minutes out from the siren. The game was momentarily put on hold when JWH copped a boot in the face from George Burgess, giving the Bunnies a bit of breathing room as they embarked upon their final set, and the final minute of the match. This time around, however, Burns couldn’t bring the same try assisting magic. Nor could Reynolds, who put in a shaky pass rather than a trademark kick, placing the Chooks at the top of the ladder after a win that was every bit as hard earned as the Cowboys’ victory in Townsville the night before. Here’s hoping, then, that these teams will meet again before finals footy is out, since this clash deserves a 2018 sequel.